1. Season chicken and pork with 1 teaspoon salt and � teaspoon black pepper. 2. 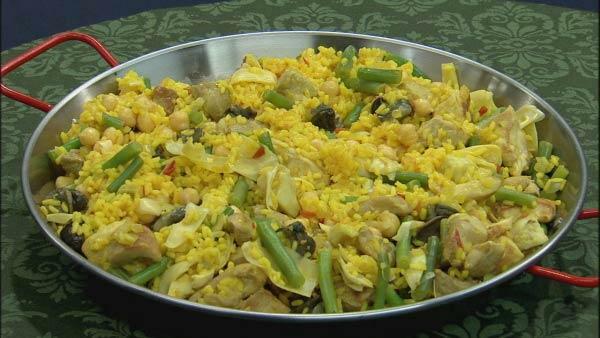 In a large paella pan (about 15-inches) or a large saut� pan, saut� chicken and pork in 3 Tablespoons olive oil. Cook until all sides are nicely browned. Remove from the pan and reserve. 3. Add remaining 1 Tablespoon olive oil to the pan. Add onions and garlic and cook until lightly browned. 4. Add tomatoes and green beans and continue cooking for another 5 minutes. 5. Add remaining ingredients and remaining � teaspoon salt and � teaspoon pepper. 6. Bring to a boil, and reduce to a simmer. Cook for 15 minutes or until the rice is al dente. Stir periodically. When the rice is cooked, turn heat to high for a few minutes and then remove from the stove. Cover with aluminum foil and let sit for 5 minutes. Serve.